Rapp Corral brings you one step closer to being in the beautiful San Juan Mountains, where rides will bring you through spectacular aspen groves and tall pines, and where wildlife has been known to stroll right across your path and in front of your camera lens.Rapp Corral is one of Durango's favorite horseback riding and winter sleigh adventure venues. 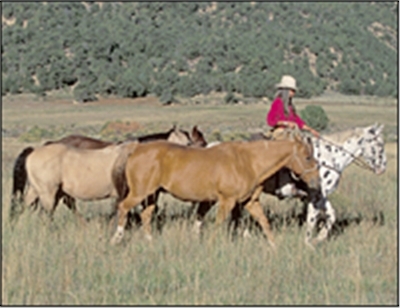 We operate with priority use permits in the San Juan National Forest and our corral is located at the entrance to beautiful Haviland Lake, about 20 miles north of historic downtown Durango. Small groups, flexible schedules, amazing trails, and well-trained horses who are very well taken care of (this is horse heaven! ), make Rapp's the choice for beginning riders, children and experienced riders too. 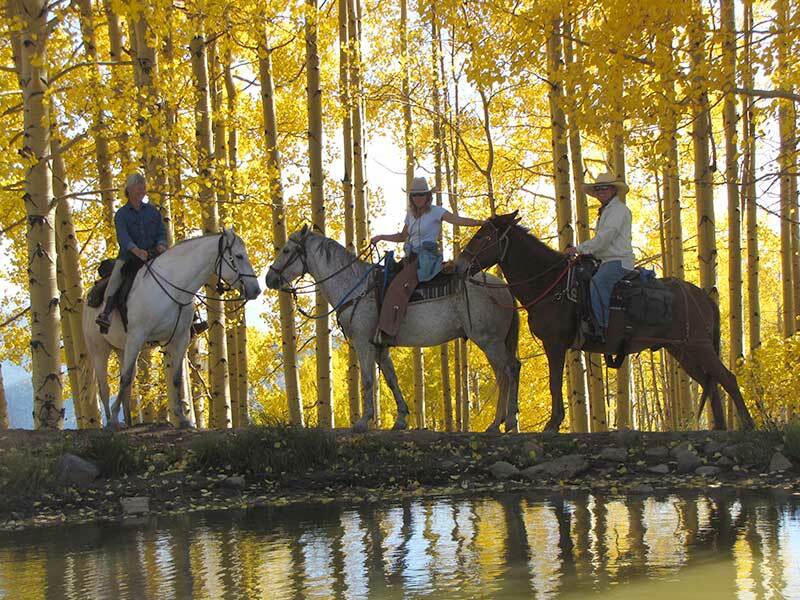 From one hour rides to custom adventures and unique winter sleigh trips, Rapp Corral makes your western horseback experience one for the memory books. For more information, mosey around our website or give us a call. We'll see you at the corral. 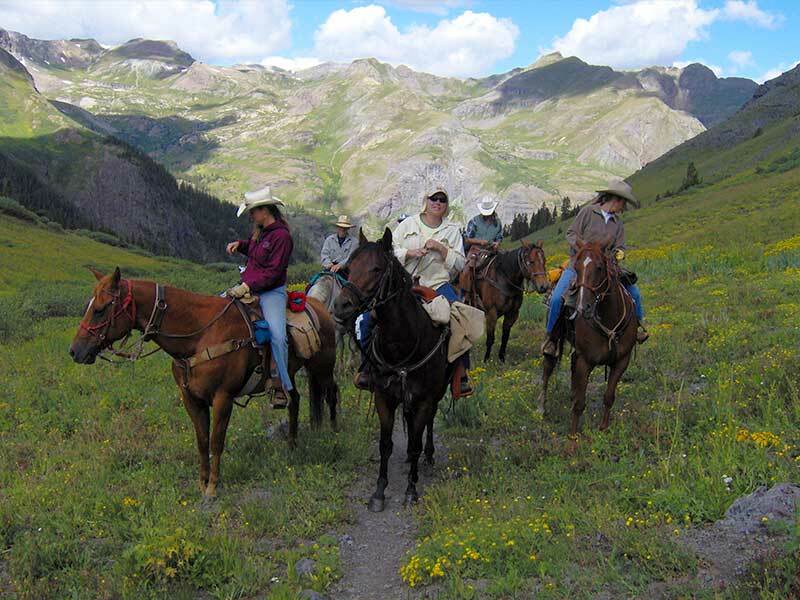 A great family adventure to include the Durango and Silverton Railroad and an afternoon horseback ride. Must be 7 years of age and older and maximum weight is 210 pounds. Available Monday thru Saturday from June 1st thru August 20th, 2016. Not available July 4th, 11th, 12th, or 13th. Begin your western adventure as you depart Durango aboard the Durango & Silverton Railroad steam train for Silverton. In Silverton you'll have 2 hours on your own to eat lunch and explore this old west mining town. Meet your shuttle driver in front of the Shady Lady Restaurant on Blair Street. Look for the Mild to Wild Rafting van for your departure to Rapp Corral. 1:45pm - Meet your shuttle at The Shady Lady for departure to Rapp Corral. Van will depart promptly at 2:00pm. MUST ALSO PURCHASE TRAIN TICKET(S) ON THE 8:00AM DEPARTURE FROM DURANGO. A labyrinth of trails within the San Juan National Forest. Our guests can ride terrain suited to their abilities and interests. Aspen forests, Ponderosa and Oak studded hillsides, meadows, and Spruce forests on the north sides make this ride truly complete. Minimum age is six years old. Maximum weight is 220lbs for all 1 hour rides. The perfect romantic or family winter memory. 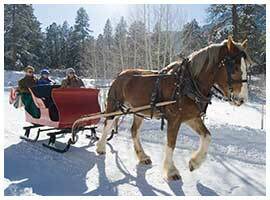 Old Fashioned Sleigh Rides in the beautiful Animas valley set in a stunning winter soundscape. Sleighs can vary in size from a small intimate 2 person sleigh or a large 10 person sleigh. Sleighs leave once an hour, blankets and hot chocolate provided. 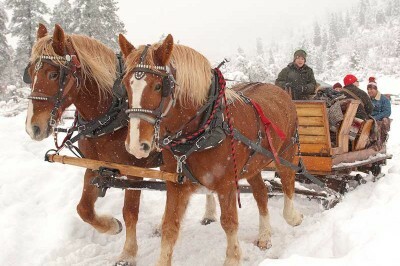 Please note, all Sleigh Rides have a $150 minimum, so group rides must have at least 3 riders. The price is the same whether you have 1, 2, or 3 riders - $150.00. A great 45 minute, three mile loop near Haviland Lake, north of Durango. Join us on our handmade sleigh sleighs, Belgian and Shire horse in bells and their finery! A labyrinth of trails within the San Juan National Forest. Our guests can ride terrain suited to their abilities and interests. Aspen forests, Ponderosa and Oak studded hillsides, meadows, and Spruce forests on the north sides make this ride truly complete. Minimum age is 12 years old. Maximum weight is 220lbs for all 3 hour rides. A great two hour excursion for all riding levels! It takes about 45 minutes to ride out to the cave where we dismount, tie the horses and take a short but steep hike down to a natural water cave. We take flashlights and explore, when we are done we hike back up to the horses and mount up, it takes about half hour to ride back through the forest to the corral. Wear long pants, good pair of walking shoes and some water. Kids must be 8 year old and we do have a weight limit of 230lbs. A variety of trails and terrain unwind before us on this two hour excursion within the San Juan National Forest. Some creek crossings, hills and expansive views of Missionary Ridge and the Hermosa Cliffs highlight this ride. Riders must be at least 8 years old and riders can not exceed 220 lbs. Wear long pants, closed toed shoes and bring along a water bottle with your camera! Deposit | Full payment due at time of booking. Other | We do most of the preparing for you — getting your horse ready, the saddle fit properly, etc. — but there are some things you can do to make your ride all the better! 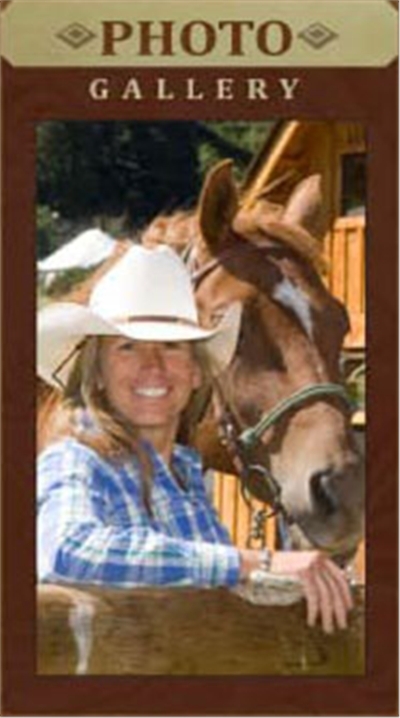 The more comfortable you are, the more your horse can feel it, and the more likely you'll both have a fantastic time. Check the weather and think in layers! Footwear: Always start with a decent pair of socks! Boots with a slight heel are the best for riding, (like a cowboy boot or riding boots) however, tennis shoes are sufficient. Stay away from big bulky hiking-type boots, these tend to get caught up in the stirrups. On your legs: Long pants! Jeans or riding tights work perfectly. If it's fall and you think it might be chilly, you may want to add a long-underwear layer. Up top: Dress for the weather. If it's sunny, wear summer shirts (and lots of sunscreen). Always bring a light jacket (we can tie it to the saddle for you). Colorado weather changes pretty quickly, so again, layers are the way to go! Your head: Baseball hats (snug ones) work well to keep the sun off your face. We recommend wearing hats that stay secure. Some of our guests like to wear their own riding helmets, which is great. We do not provide helmets. If you don't have a horseback riding helmet, bicycle helmets can be a great substitute. Bring some water or something to keep yourself hydrated. Even if it's a short ride, you'll want to take a drink before we head out on the trail. The best way to avoid altitude issues is to stay hydrated. Sunscreen, sunglasses (a strap for these if you have one is a great idea), gloves (not necessary, but nice), a granola bar or snack to have after your ride or during the longer rides. When you make your reservation, just ask us any questions you have and we'll get you set up and ready to ride!